There is no deadline for sending your writings. You can share your thoughts with us any time. As a boy, I liked his pipesmoking, deductions, knowledge of chemistry and Baritsu... However, later I found he didn’t use his knowledge of chemistry in solving the cases, but I have started to practice martial arts and smoking a pipe very soon afterwards. Now, I appreciate mostly his bohemianism and eccentricity, but also his abductions, bravery, gentlemanship… and, last but not least, his pipe, and a violin that I never learned to play. 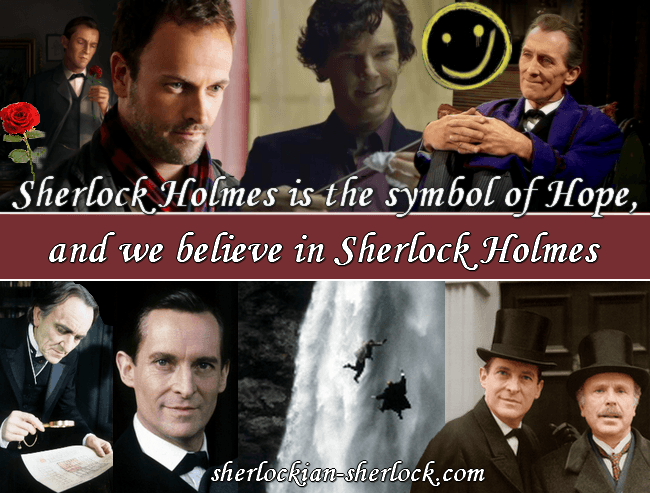 What I like in Sherlock Holmes: He is a genius (but nobody doubts that), it is wonderful one can be assured that he will cope with all mysteries. Sherlock Holmes is an eccentric, but doesn’t worry about his standing out, he is different and thus a bit of an outsider, often not understood by his environment. He is unbelievable brave, loyal (say whatever you want, but he would give his life for a friend) and unconditionally sincere. He has a strong sense of justice and truth (in this order). Friendship: First thing I recall after hearing the name of Sherlock Holmes is “friendship”. For me the main general topic of all the stories is the friendship between Holmes and Watson. Undoubtedly it is one of the greatest friendships in the history of the world literature. 1. Characters of Holmes and Watson: Secondly, there are the characters of both gentlemen. Constantly I return to their adventures because of perfect description of their characters. Holmes as an indefatigable fighter for justice has also a great heart, but he hides this side successfully and would never admit it himself. And Watson on the other side is reliable and intelligent. Watson is a fixed point in life for Holmes with his flaws. 2. Mysteries: As a true Holmesian and detective stories lover I like to untangle the mysteries and thus become a companion of those two brilliant characters. 3. And when feeling blue, I always like to read or watch one of the cases of Sherlock Holmes. And returning to this familiar milieu is like coming home. It gives me a feeling of security. Growing up, I was fascinated with the famous super sleuth from Baker Street. First of all it's his detective work, as we as an audiance are always left astonished with his amazing powers of deduction and the way he solves crimes. They there's his demeanour, the way he acts, the way he interacts with other characters and the way he goes around his daily lifestyle is always fascinating even when you don't agree with his actions or his methods. Then there's his relationship with other characters, primarily of course being his closet friend and colleague, Dr. John Watson and the way their chemistry is portrayed. There's also his personal faults and struggles that prevent him from being a boring Hart Stu. And finally, there's his particular sense of morality, while he tends to get his man or woman, there are times when he would look the other way feeling that bringing culprits to justice depends on the circumstances.